Intangibles are an important part of the market value of companies and organizationsgenerally analysis corresponds to the need for accounting traditional notIt provides sufficient information regarding the measurement and valuation of suchmeans. In the development of the economy that emphasizes knowledge, has highlighted theimportance of Intangibles as generators of value, given thatusually greater importance is given to the physical and monetary resources, without thisthe identification of Intangibles is a new reality; which provides the bodythat values greater efficiency and true sources of value creation. Sometimes a few words are in fashion and many use them without knowing that they arespeaking. My intention is not only to give a definition as the dictionary, but understand theconcept and how we can use it to our advantage. I speak not to use the word, but ita tool we can use in companies and businesses. 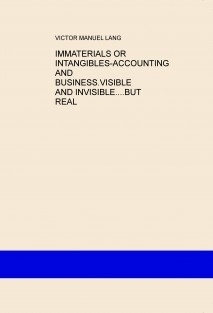 First let us define, eg: are intangible (or even immaterial) costs and assetsintangibles. After analyzing the contributions made so far in the field of assetsintangibles, the concept of liability is introduced. The existence of this concept is justifiedfrom an accounting perspective and from a strategic perspective. Both in academia and in business management, is increasingly commonfind references to the term Knowledge Society, to refer to a stadiumdevelopment of society, characterized by rapid changes and the importancefundamental technology, and in which the generation of wealth and well understoodclosely linked to investments in innovation and, especially, to theknowledge generation. Comes a new element in the models of intellectual capital: Intangible liabilities.In this new socio-economic scenario and configured, the generation capacitycorporate wealth is not understood as related to efficiency in managementtangible assets; quite the contrary. The generation and maintenance of benefitscompetitive, that determine the ability to create value for owners, they areclosely linked to the achievement of intangible investments and the efficiency withcalled intangible assets are managed.